Rendering courtesy of City Ventures. Photos below by Brian Addison. 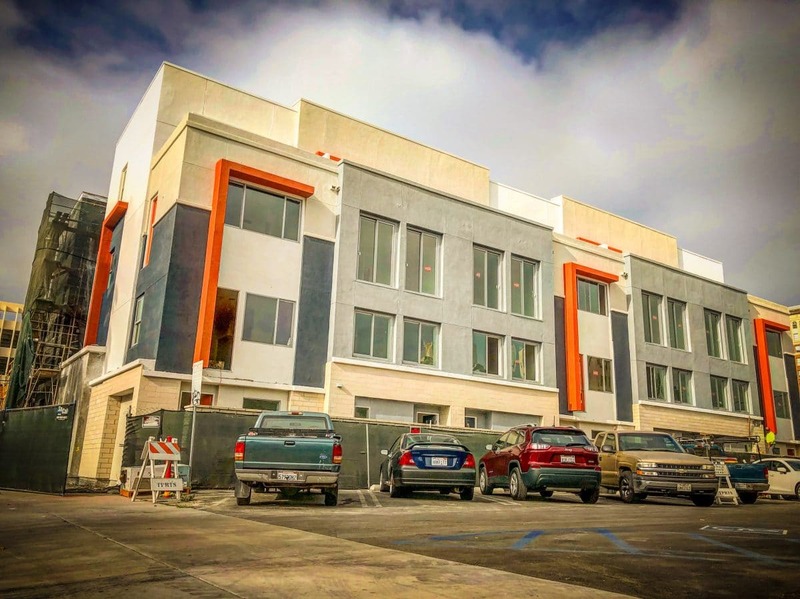 Progress is quickly moving forward on Irvine-based City Ventures’ oddly placed, single-family townhouse development on the northwest corner of Broadway and Elm in DTLB, with its northern end of townhomes nearly complete. 40, four-story townhouses will take over a former Redevelopment (RDA) property and, instead of aiming for density in the urban core of the Downtown, aim for the opposite. The single-family homes will have garages on the first floor with solar-powered, all-electric living spaces above on the following three floors as part of the firm’s “Green Key” initiative that focuses on eschewing natural gas-fueled appliances along with electric car charging systems in the garages. While prices were originally slated to start in the $400K range, they have already increased to $600K as construction continues. City Ventures also acquired two other RDA properties in North Long Beach, each at 4800 and 5100 Long Beach Boulevard respectively, for $3.75M and also plans to build townhomes there—69 to be precise. And it is here where the discussion of location becomes paramount: placement of single-family homes, nothing short of a luxury in today’s housing climate, needs to be strategic—and including them one block away from the Blue Line and directly next to the massive Broadway Block project. Yes, they are building 3-story townhouses next to a project which will have a 21-story high rise. Add individual garages into that equation, not providing a single incentive to take transit, and you will have 40 future families frustrated by traffic and towering buildings around them. In North Long Beach, particularly given price point, it is far more appropriate and needed: it isn’t near transit, which would explain the garages, and has a height and density point appropriate there.